If you didn’t know better, you’d think I might be reviewing two of my new favorite lipstick colors or new song by Stevie Nicks. But like beautiful colors and amazing songs, this dynamic duo are my right hand gals. They are the lovely voices on the phone that book your appointments and answer your questions. They arrange and stock the shelves and tables with pretty new things in our retail area. 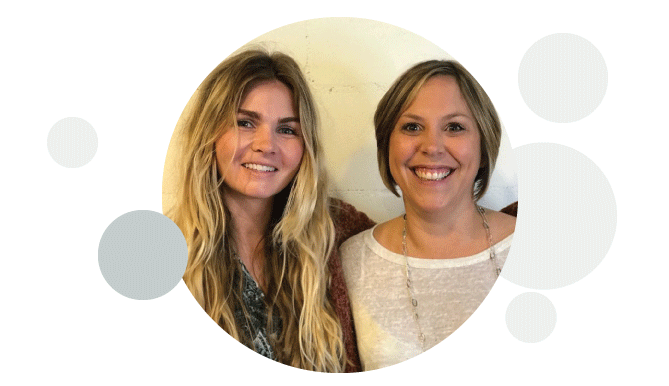 Along with Kim, Tara and Emilie- this team is such an important part of what makes Philosophie run like a well oiled machine and oh so inviting. Our desk game is strong. Whenever I get the crazy idea to rearrange the shop, these ladies are excited and ready with tools in hand. If we were watching a movie right now, this would be the moment where our work montage would begin... remember the dressers Rose and I put together? She makes everything fun! We also painted retail shelving and belted out Bruno Mars ( occasionally pausing for a dance break). It’s refreshing to work with people who share your enthusiasm. Rose and I stayed late to restock shelves and put most everything back in its new home at the end of the last revamp. Misty’s calm demeanor helps us focus and move forward when I could really be silly with Rose all day. Such a perfect balance. When my family and I decided to spend some time in France to learn more of the language and challenge ourselves, I’ll admit I was worried about not being at the shop everyday. Philosophie is my baby. I’ve worked hard along with everyone to help it thrive and grow. But knowing that this team has the all hands in approach, I knew my babe would be in safe capable hands. Everyone is invested in the common good. With Rose and Misty at the helm, things get done. Positivity is high. Though I’m across the pond, I still chat with everyone weekly- when I’m lucky, daily. Somehow I always manage to look hideous on FaceTime, ( it’s usually the end of my day and beginning of theirs) it’s always so fun to see everyone’s face and have a laugh. Grateful may not quite cover how I feel about these guys. It’s a gift to have this opportunity with my family. We’ve worked hard to put this venture together, not only to check a bucket list item, but to expand our children’s horizons. It wouldn’t have happened it it weren’t for Rose, Misty and our incredible team.